Pfizer has agreed to pay the federal government $60 million to settle allegations that its employees bribed doctors and other foreign officials in Europe and Asia to win business and boost sales. The Securities and Exchange Commission said Tuesday that Pfizer’s overseas subsidiaries made illegal payments to health care workers in China, Italy, Russia, Croatia and other Eastern European countries. As early as 2001, Pfizer sales representatives tried to conceal the bribes by recording them as legitimate business expenses for travel, entertainment and marketing purposes, the agency said. “Pfizer subsidiaries in several countries had bribery so entwined in their sales culture that they offered points and bonus programs to improperly reward foreign officials who proved to be their best customers,” said Kara Brockmeyer, chief of SEC’s foreign enforcement division. Pfizer’s China operation created a point program that allowed doctors to purchase gifts based on points earned for prescribing Pfizer medications. In other cases, Pfizer would invite high-prescribing doctors to club-like meetings as a reward for choosing Pfizer products. As part of the settlement, Pfizer’s HCP subsidiary agreed to pay $15 million to resolve similar bribery allegations with the Department of Justice. In addition to the settlement fee, the Pfizer unit agreed to a two-year deferred prosecution agreement. New York-based Pfizer first disclosed the misconduct to SEC and Justice Department officials in October 2004, and cooperated with the government’s investigation. Pfizer, the largest pharmaceutical company by sales, neither admitted nor denied the allegations. “The actions which led to this resolution were disappointing, but the openness and speed with which Pfizer voluntarily disclosed and addressed them reflects our true culture,” said Amy Schulman, executive vice president and general counsel for Pfizer. The charges against Pfizer were brought under the Foreign Corrupt Practices Act, which bars publicly traded companies from bribing officials in other countries to get or retain business. In the past five years, the Justice Department has investigated a number of pharmaceutical and medical device companies that operate overseas in connection with the law. Last year J&J agreed to pay $70 million to settle civil and criminal charges of bribery brought by the Department of Justice. Industry experts say giving gifts and payments to doctors is not unusual for drug and medical device companies who operate in dozens of countries. 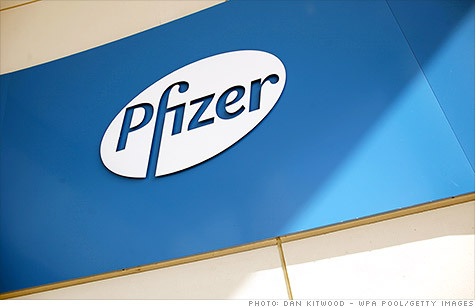 Shares of Pfizer Inc. slipped 41 cents to $23.85 in afternoon trading.